All are welcome to attend regardless of experience or current level of fitness. If you believe you may require modifications in order to participate, please consider contacting the instructor in advance so we can best prepare to accommodate your needs. Yoga truly is good for what ails you. This is a therapeutic class where you can bring all of your aches and pains, conditions and challenges, and emerge from class feeling refreshed, stable, and at ease within your body. Classes will accommodate a variety of levels and needs, with props and modifications offered so that you can explore what serves you best. Expect flowing movements to warm the body from within, mobility work to find fluidity, and restorative poses to create space for introspection and cultivating inner peace. A full hour mid-day to show up for yourself to practice being open, curious, and kind with whatever comes up. Expect a mindful/meditative focus, an invitation to set an intention, or imagery that evokes a theme. You’ll hold poses just a bit longer and transition slowly to allow ample opportunity to notice a new sensation or layer of depth. Whether it is your first or 1000th time practicing the pose, there is plenty to explore. All are welcome! Register ahead, or check the schedule in advance for any last-minute changes if you plan to drop-in. Give yourself the gift of time by showing up for yourself and going with the flow. Expect a mindful/meditative focus, an invitation to set an intention, and focus on the breath linking simple flows and pacing for longer holds. Transitions are a bit slower, allowing for ample opportunity to notice sensation and layers of depth. All levels are welcome, modifications are offered and encouraged so that you can make your practice your own. Ever wonder why you wobble? Join Catherine to learn the physiology of balance, and how a certain amount of wobble is a good sign you are appropriately challenging yourself! 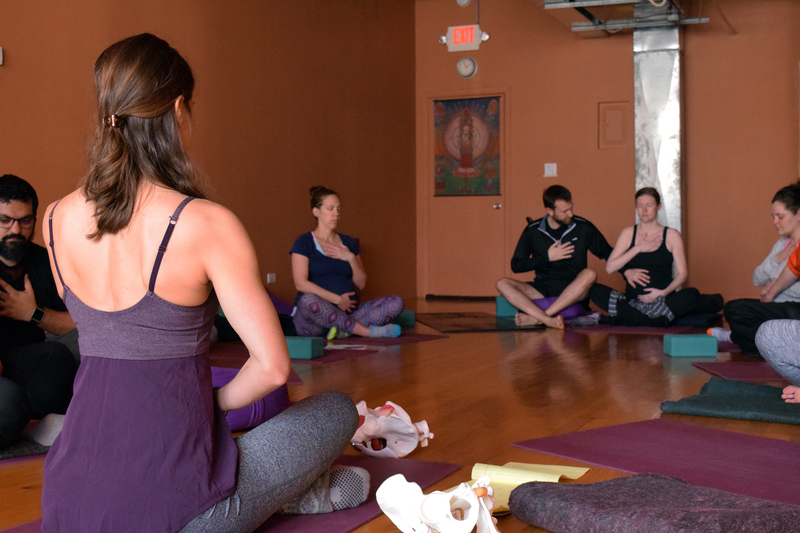 This workshop will explore the mechanisms that allow us to sense our bodies in space and stay centered and balanced as we move through a physical yoga practice and through life. Beginner through advanced balance challenges will be provided so that all participants can safely challenge and strengthen their balance as part of a yoga practice. Catherine helps you to create a safe space for this practice by helping you understand how balance works so that you can choose intelligent and appropriately challenging modifications. By getting grounded in your body, as often as possible, you can train your brain to be less reactive over time. Using a chair as a prop can make yoga accessible for individuals who have difficulty with sitting on the floor, need support for standing balance poses, and also allows options for mid-workday yoga for those who are sitting all day. But the most common feedback offered after one of Catherine’s chair yoga classes is, “that was really hard!” We tend to think a chair will make poses easier, so many are unprepared for the ways that this prop will challenge you to dig deep and explore different aspects of your practice and your self. Discover ways to work with posture and breath by opening up the chest and shoulder area to create space and a sense of ease. We will review basic anatomy of the neck, rib cage, and shoulder area and discuss factors that contribute to pain and stiffness in these areas. Guided yoga practice will integrate active and restorative poses that create space and balance around the heart, chest, upper back and shoulders. A review of the anatomy of the pelvis provides a better understanding of how your yoga practice can prevent/reduce pain and dysfunction at the spine, pelvis, and knees. 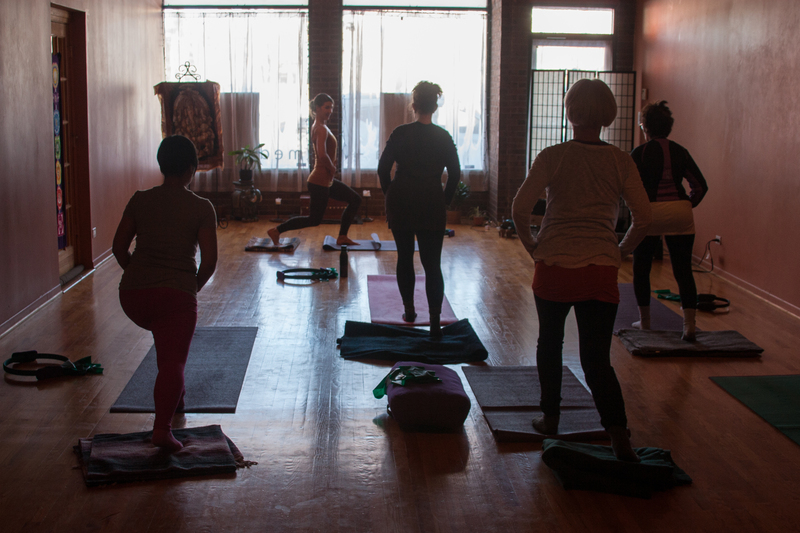 Guided practice including active and restorative postures and breathing techniques will strengthen and stretch all four quadrants of the hips, bringing balance to the pelvis. This workshop is appropriate for all levels and is especially therapeutic for those who are prone to pelvic, hip, knee or low back pain. This workshop is appropriate for all levels, and for pre/postnatal participants. No previous yoga experience required, just bring an open mind, your core and your pelvic floor! This series of workshops will guide you through a discussion that covers anatomy, physiology and self-care tools that are relevant to the topic/theme of the workshop. You can expect some gentle flowing movements to warm the whole body, with a focus on supported restorative poses that will leave you feeling relaxed and restored in body, mind and spirit. Catherine tailors her classes to the needs of participants of all ages and conditions. She uses props to enhance each movement, and modifications that offer me the opportunity to take care of my body using weekly Pilates and Yoga group classes. I also see her in the clinic for treatment of my arthritis, and I have found her expertise, respect for the human body and her personal centeredness to be an extraordinary resource. I have taken classes, workshops, and private sessions with Catherine, and find her to be very knowledgable, present, and sincerely interested in helping each student to reach their own potential. Her teaching is clear, based on science as well as experience. She has a strong ‘body sense’ and loves to challenge her own limits and will challenge you to be your own best self! As a 60-year-old, I want to keep my body strong and moving freely for many years to come. The core work I’ve done as a student in Cat’s class has changed my body, made me stronger, increased my body awareness, and reduced my back pain. She brings a sparkly energy and creative approach to every class, and always seems to find a great balance between work hard and feel good. When I needed to do a round of physical therapy, it was great to be able to see Cat, a highly trained and caring physical therapist that already knew my body, and could keep an eye on me in class once my PT was over.